Despite its common cultural heritage, Europe is the continent in which there is greatest diversity. This diversity, as well as the distribution of people and wealth, goes back a long way in history. The geography of the industrial revolution and the process of formation of nation states can only be understood when looked at in terms of a continuation of mediaeval Europe and of the formation of the economic mercantilist system, concentrated in Western Europe. 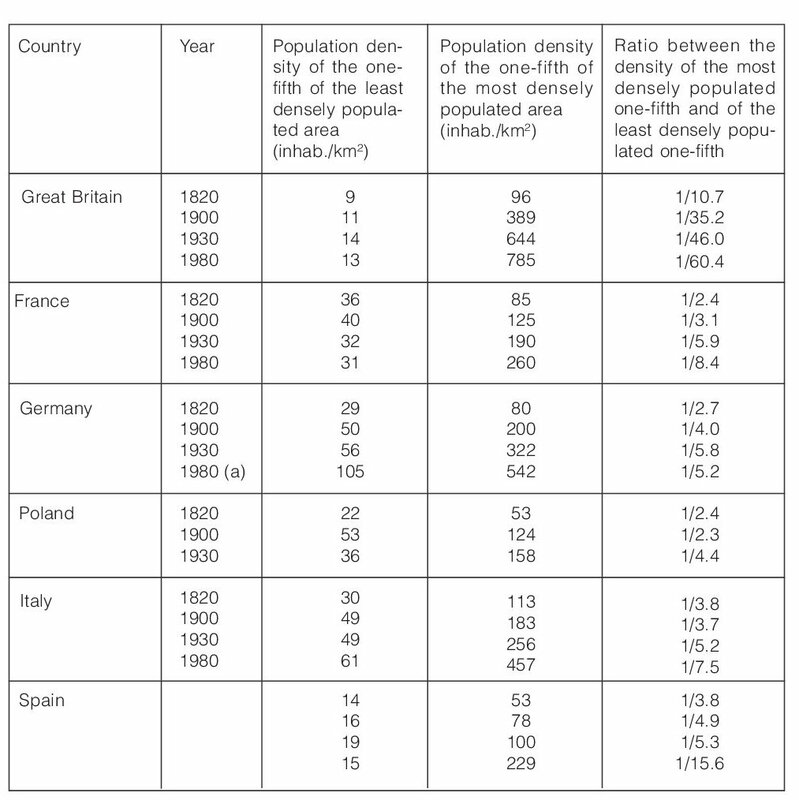 Pre-industrial urban population density was a major factor in the subsequent differentiation. The Communist interlude in Central and Eastern Europe is ending up with the reintegration on a peripheral and semi-peripheral basis of this part of the continent into the world economy and the revival of acute nationalism. The extent of the disparity in economic terms between this area and Western Europe is a particularly daunting challenge, given the fact that the populations in Centre-Eastern and Eastern Europe share the same identity and references points as those in Western Europe. L’Europe est le continent où la diversité est la plus importante, au-delà de fonds culturels communs. Cette diversité, de même que la répartition des hommes et de la richesse, s’inscrivent dans les temps longs de l’histoire. La géographie de la révolution industrielle et les modalités de formation des Etats-Nations ne peuvent se comprendre que dans la continuité de l’Europe médiévale et de la formation du système économique mercantiliste, centré sur l’Europe occidentale. Les densités urbaines pré-industrielles sont un facteur important des différenciations ultérieures. L’intermède communiste en Europe centrale et orientale se termine par une réintégration semi-périphérique ou périphérique de cette partie du continent dans l’économie mondiale et un regain de nationalismes exacerbés. L’ampleur des disparités économiques avec l’Europe occidentale représente un enjeu d’autant plus dramatique que les populations de l’Europe centre-orientale et orientale partagent des références identitaires avec celles de l’Europe occidentale. The author would like to thank Violette Rey from the University of Paris I and the Ecole Normale Supérieure of Fontenay/Saint-Cloud for her suggestions and comments on this text and for her invitation to take part in a series of seminars she organised with Thérèse Saint-Julien, under the aegis of the CNRS, on the theme ‘Questioning European identity’. The seminars provided an opportunity for the author to refine some of the ideas set down in this article. 1The social production of areas is the core subject matter of geography. The result of such spatial production is expressed in the distribution of people and of the wealth they produce. Maps showing population density and per capita added value summarise the culmination, at a given time in history, of this social production: they form the fundamental geographical subject matter that must be explained. 2On a small scale, the interweaving of these two maps depicting the patterns of the population and the wealth it produces provides an image which can be described in relatively simple terms: first the opposition (essentially east-west) between a rich Europe and a poor Europe. 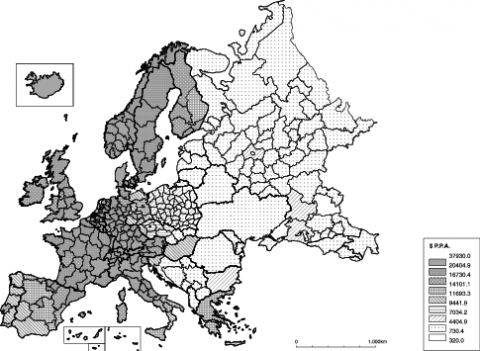 Within Europe the rates of divergence are exceptionally high compared with those of other, larger continents: the ratio between the per capita product of the 25 % of the European population living in the richest regions and that of the 25 % of the European population living in the poorest regions is approximately 1 to 6.5, over an area of 10.5 million km². Admittedly it is even higher in Africa – 1 to 8.6, but over an area of 30.3 million km². In Asia, however, it is only 1 to 4.9 over an area of 44.4 million km², while in Latin America it is 1 to 2.3 over an area of 20.5 million km², and finally in North America only 1 to 1.4 over 19.3 km², with, moreover, very uniform consumption models in the latter case. It is true that the figure would rise to 1 to 3.2 if Mexico were included with North America, but then should not the Maghreb and Turkey be added to Europe, since they have similar economic and migratory relations to those of Mexico and the United States? Enlarging Europe to encompass these close Mediterranean neighbours does not, paradoxically, change the ratio, which remains at 1 to 6.5, but this time over an area of 14.3 million km². The diversity of ‘little Europe’ is not, therefore, simply a formula in school manuals: it can actually be measured using the tools of the official economy. 3The east-west opposition is not reflected in the same way in the pattern of population: the main population vacuums are found in the north and north-east. South-east Europe is far from being a vacuum. It comprises a complex mosaic in which areas with a high density adjoin others that are less densely populated, without this necessarily corresponding to the constraints of the relief: inversions of density are frequent, with plains that are emptier than mountainous areas, or at least their piedmonts, and this was even more marked in the last century. In the west there is an axis of high density starting in the north of England and continuing to Italy, virtually uninterrupted by the Alps, and stretching further south than Roger Brunet’s ‘blue banana’. Another axis of high density branches off from the first, stretching from west to east along the southerly border of the Hercynian mountain range, following the Hellweg and one of the routes of the German mediaeval ‘Drang nach Osten’. However the western and northern edges of the British Isles are scantily populated, and in particular there is a vast continental ellipsis characterised by low densities of population, with a huge axis stretching from the Ardennes to Andalusia, through the interior of France and the Iberian Peninsula. Madrid, and even Paris, are isolated within this area. Figure 1. Population density in Europe around 1980. Figure 2. Added value per inhabitant in Europe (1995). 4In the west wealth is in effect concentrated in the ellipsis ranging from the centre of England in the north to Italy, with Paris already on the margin. The centre of gravity of this ellipsis has tended to move southwards since the end of the last War. The limits of the wealth ellipsis are encroaching on the Third Italy and advancing towards Rome, while the centre and north of England are becoming marginalised. Weak economic areas, going through problems of conversion, have indeed gradually emerged within the ellipsis, particularly on the northern flank, in the old industrial regions, with levels of per capita product that are now hovering around those of the southern periphery in the south of Italy and the Iberian Peninsula. But in terms of countries, differences in development are tending to diminish and while the great Mediterranean periphery of Western Europe is still lagging behind in economic terms, this is almost marginal compared with Eastern Europe. Wealth per inhabitant in Scandinavia is roughly the average of Western Europe but no higher, contrary to what may be suggested by the standard of living observed there which is a result of the virtues of the very distributive socio-economic models and the extent and precocious nature of environmental awareness. This is the picture that must be clarified. 5While the physical architecture and climatic pattern may help to explain landscape diversity within a historical and cultural dialectic, they do not justify these patterns of population and wealth distribution, apart from the northern Europe vacuum. It is true that the extension of the steppes to the Pannonian plain provided an easy route for travelling to the west for Asian horsemen and, conversely, the general orientation of mountains following parallels fostered the penetration of oceanic influences into the interior of the continent. But north-south movements were always important, or even more important: even the Alps never formed a barrier to cultural and economic influences. An exceptional case of topographical unity which became the cradle of a political ensemble – Switzerland – is in fact based on a mixture of relative isolation and control of Alpine passages. 6In itself diversity in Europe is not any greater than that which can be observed in North America, but is above all of a different nature and sensitive to a different scale, that of small ‘districts’, the ‘pays’ in the old French meaning of the term. This diversity is essentially based on a dialectic between economics and culture, fuelled by exchanges, contacts, clashes, and always by the highly significant presence of man producing and organising his territory. The diverse nature of the European landscape is marked by modest-sized units. It is synonymous with smooth connections between different environments and resources located within short distances, and with complementary features and areas of specialisation which permit economies of scale and gains in productivity. Spatial diversity fosters the conditions necessary for economic accumulation. 7Yet Europe, despite its diverging features, is also welded together with powerful feelings of common origins which transcend religious opposition, even if this has been a vigorous source of division and conflict on the continent, which even fifty to eighty years of radical political isolation of Central and Eastern Europe has not fundamentally altered. Over and above all the very bloody struggles, these identity-based foundations go back to the Roman Empire, to universalist Christianity and to the widespread use of Latin by the literate of mediaeval times and of French by aristocratic classes up to the 19th century. China and India did not engage in the kind of matrimonial exchanges that linked dynasties in quite distant parts of Europe from the Middle Ages on. 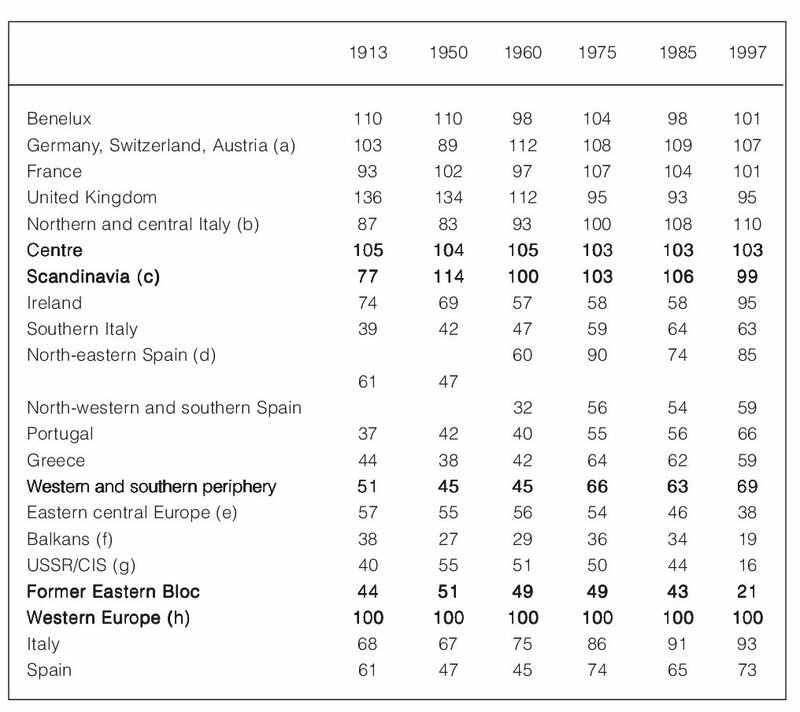 8From the figures supplied by, among others, Maddison (1995) and Bairoch (1997), it can be estimated that the consequences of the Industrial Revolution and its effects multiplied the per capita product in Europe, at a constant value, by 1.5 between the mid-18th century and the mid-19th century, by 2.7 between the mid-19th century and the mid-20th century and by 3.3 between 1950 and the present time, thus in other words a global multiplication between 1750 and 2000 of over 13 (under 7 for the world average)! During the same period, the population rose from 160 million to 730 million, in other words a multiplication by over 60 of total product. 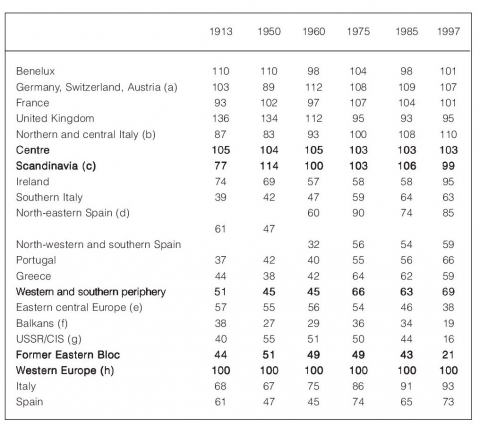 The number of farmers in the active population fell by over three-quarters to under 12 %, or by approximately 5 % if the former Soviet bloc countries are excluded. Yet despite such drastic changes, which one might have expected would radically rearrange the map of Europe, the permanent features are remarkable, at least on a small scale. 9This is because the effect of long-term historical processes is felt through the socio-political and cultural frameworks which were prematurely established and through the way in which these frameworks were to permit subsequent economic deployment. 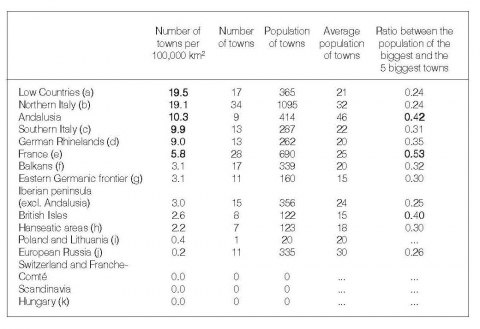 10Population density was considerably higher in the eastern than in the western part of the Roman Empire. On the one hand the Empire comprised regions that were highly civilised, often practising intensive farming, and on the other fairly empty areas in which it was to establish big extensive farming for the benefit of Rome and the colonisers. 11This difference was to play an essential role in the future of Europe, on each side of the line dividing the Eastern and Western Empire which was established during the 4th century and endorsed by Theodosius in 395. 1 And also with the creation by Genoa and Venice of maritime routes circumventing Europe. 12In the east, the Empire was to continue for a long time, though in a weakened state. Relations were to remain close between the central political power and the Church, which under the Caesaro-papist system was subject to the former. Thus even to the present time, religion was to be an affair of state, with reciprocal consolidation of national, religious and ethnic identities. Even when the state no longer existed, an authoritarian, supervisory Church based on traditionalist values would preserve ethnic conscience, particularly since the Ottoman Empire in the Balkans did not make much attempt to spread the Muslim religion1. In the west, the big land owners and barbarian chiefs who invaded the Empire took over political power in a context of fragmented territoriality. The relations between the feudal lords and the Church were to be much more complex, with the Church claiming universality on a spiritual level, but playing its own game in temporal terms – its own games, because its eminent members also held various political positions based on land ownership and territorial status. 13The foundations for the great schism of 1053 were thus laid as far back as the 5th century. Missionaries spreading northwards extended the limit between the Eastern and Western Empire, between the Greek Church and the Latin Church: Slave Europe was to remain mainly Orthodox, with only the parts to the west of the limit between the Empires, Croatia and Slovenia, and the regions to the west of its northern prolongation, the Czech Republic, Slovakia and Poland, staying Catholic. In these last three countries, the embracing of Western Christianity was the result of a combination of Germanic influences and resistance to this same German crusade or pressure. Figure 3. Europe in the Middle Ages. 14In the confusion and complexity of the powers characterising the western part of medieval Europe, which was a kind of protected ‘land’s end’ following the stabilisation of the Vikings and their Norman ‘assimilation’, a merchant bourgeoisie was able to emerge around the 10th -11th centuries. It was to claim in turn a link between wealth and the political power, beside the feudal landlords system. The foundations were laid for a less holistic society, which was also different from those in other parts of the world because of the more nuclear families that favoured the accumulation of wealth. 15Unlike Western Europe, Eastern and Centre-Eastern Europe was to undergo still the shock of the last invasions from the East, the Mongols in the 13th century and the Ottomans in the 14th and 15th centuries (and even up to the 17th century with the siege of Vienna), with major consequences in terms of a delay in accumulating wealth and, during the reconquests, the strengthening of imperial and/or aristocratic power, which was to emerge, among other things, in the development of the second wave of serfdom and the lack of progress in urban density, which was already initially mediocre, and even the regression of this in the Balkans and in Russia. Table 1. Urban development of Europe in 1300 (towns with over 10,000 inhabitants). 16The upsurge in trading activity in north-western Europe led to the emergence of major circulation axes between there and the north of Italy, extending the maritime routes bringing luxury products from the eastern Mediterranean. Flanders and northern Italy were then the two most urbanised regions of Europe, with the exception of Byzantium and the southern Arab edges. These links were already the forerunners of Brunet’s ‘blue banana’. At the outset they were based on two main axes, the one passing through the Champagne fairs and the Rhine axis. While the Champagne towns were soon to be undermined by the competition from Paris, arising from the strengthening of royal power(3), the Rhine axis was to witness the development of dense urbanisation, but involving small towns, partly modelled on the network of garrison towns bordering the Roman Empire. These were already the origins of the difference between French and Rhineland spatial patterns. This was because, unlike the King of France, concerned above all with the accumulation of territory around his original county, the King of Germania was more worried about fighting for the Imperial crown, and hence more interested in Italian adventures. Since his position was based on an election, a too marked strengthening of his territorial positions would hinder the election of a successor in his hereditary lineage. Hence there was no evolution towards the centralisation of royal power. The territory was also split by the strength of the ecclesiastical principalities and the many towns competing with each other. The biggest states in the Germanic Empire were to emerge in the east, in a much less urbanised Germania, in an area of marches and conquered land, on agrarian estates rather than on trading bases. This eastern Germanic area or, even further east, the regions dominated by the German traders, was organised on the basis of two west-east axes: the Hellweg and the salt route, passing through the rich land of the Börde and along the northern edge of the Hercynian basins, and the Hanse maritime route. While the second essentially remained a string of ports, the first comprised a line of considerable population density because of the good agricultural land and the contact with the metallurgical and forestry-based settlements in the Hercynian mountain range. 17Because of its insular isolation and the strong control of the nobility by the monarchy, state centralisation was introduced from the time of the Norman conquest in England, even earlier than in France, and with it London emerged in a prime position compared with an otherwise rather weak urban fabric. 18Royal centralisation also occurred early in Portugal and Spain. The monarchy there was to launch the first colonial operations at the same time as the Ottoman forces closed off the eastern Mediterranean to trade with Europe. But here the power of the land-based aristocracy, which was flanked by the monarchy and the Church and strengthened by the Reconquista (which significantly weakened Muslim towns2), fuelled by resources from the New World and the control of sheep rearing and the wool trade through the institution of the Mesta, was to block on a long-lasting basis the development of the urban bourgeoisie. Particularly since the Habsburgs of Spain financed their penniless coffers via the bankers in their Italian and German territories. Imperial bankruptcies were in fact to have major consequences in terms of curbing the development of northern Italy and southern Germany, two interspace regions that were in fact ravaged by the wars waged by the big mercantilist states in full expansion in the 16th century. In Portugal and Spain, in any case, the result was the very considerable primacy of the royal capital in the midst of scantily urbanised rural areas. Thus neither Spain nor Portugal was to benefit from the shift in the centre of gravity of the European economy to the Atlantic side. 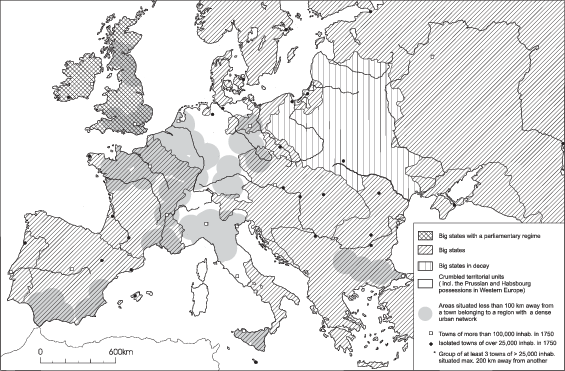 From the 16th century on, the power of the land-based aristocracy and the undermining of the development of the merchant bourgeoisie placed these regions in a peripheral position in terms of the European economy, confining them to the supply of agricultural raw materials or, later, minerals. The same was to happen in southern Italy, where the great feudal land-ownership was introduced with the Norman conquest and was bolstered by the lengthy absenteeism of sovereigns belonging to foreign dynasties. The influence of Naples, the second biggest town in Europe after Paris in 1600, and still in third place in 1800 (always with the exception of Istanbul) is a reflection of the parasitical nature of an aristocratic monarchy which extracted agricultural added value rather than establishing a basis for a subsequent capitalist accumulation. Table 2. Urban development in Europe in 1600 (towns with over 10,000 inhabitants). 19The evolution of the urban port locations shows that mercantilist capitalism and the beginning of the Industrial Revolution were characterised by growing extraversion of the European economy, whereas on the other hand a recentring began at the end of the 19th century. This recentring was to increase further after the Second World War: in the west with Fordism, which considerably increased the share of European markets as outlets for industrial production and proportionately reduced the incorporation of raw material in total output, and in the east with urban development linked to autarkic industrialisation. Today, the development of agglomerations, conurbations and suburbanisation makes it difficult to produce homogenous calculations at European level. 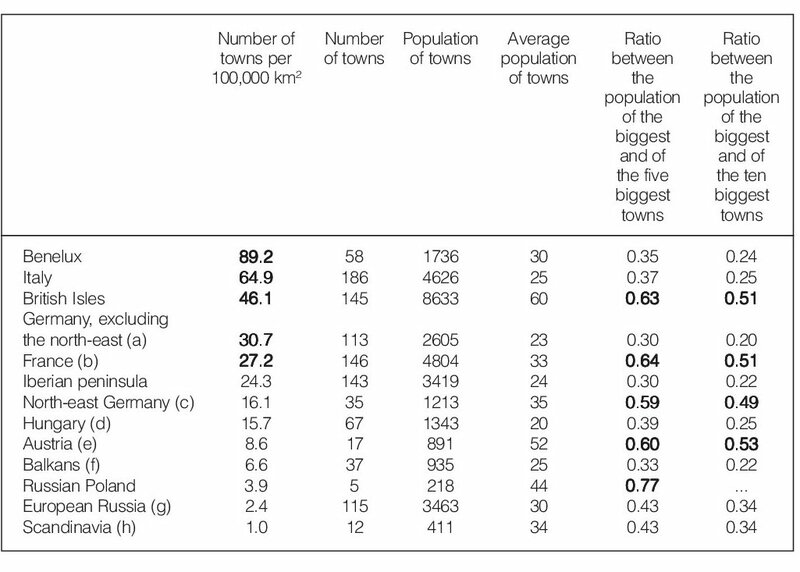 Nevertheless a rough estimate based on urban population figures supplied by Fischer Weltalmanach (1997) is sufficient to confirm the extent of this trend: in 1997 the 60 biggest European towns accounted for 118,548,000 inhabitants (a figure that under-estimated the numbers because full account was not taken of the actual morphological limits of large agglomerations). Only 31 % were in a port location. 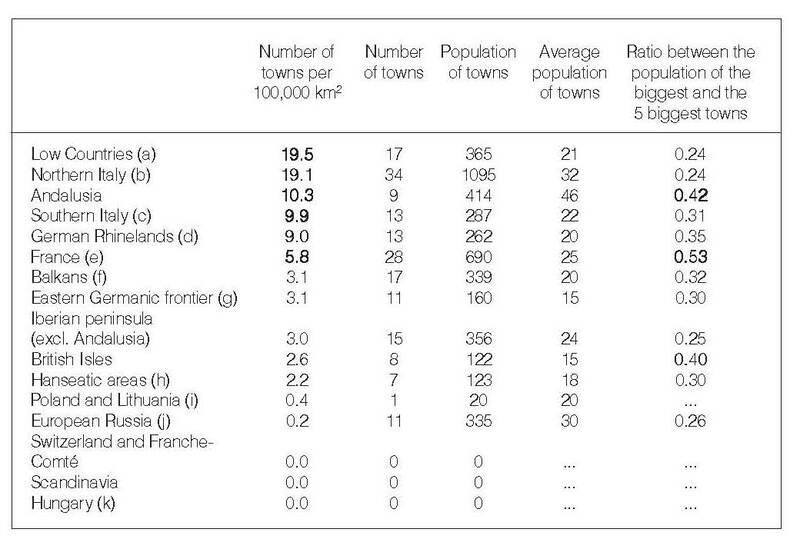 The European territory (including the Urals) of the former Soviet Union accounted for 8 % of the population of the 60 biggest towns in 1900; this percentage is now 42 %. 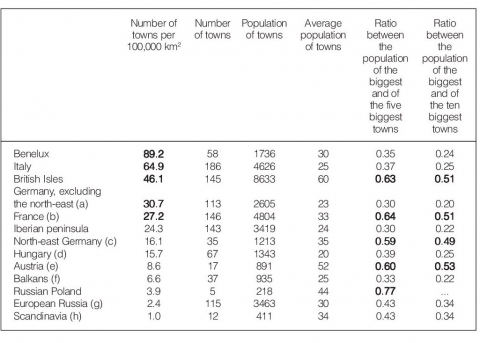 This last figure is doubtless overestimated because of the better adjustment of administrative borders to urban actuality in the east than in the west owing to the absence of local autonomy and the planned nature of town developments, and on the other hand, the extent of suburbanisation in the west. 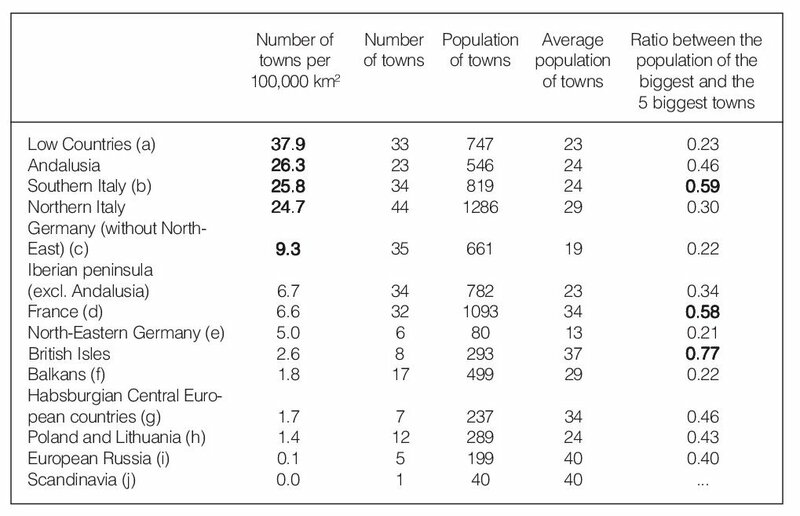 But the change in the figure is sufficient to demonstrate the extraordinary speed and the extent to which the rural community was attracted to urban areas by forced industrialisation in the Soviet Union. 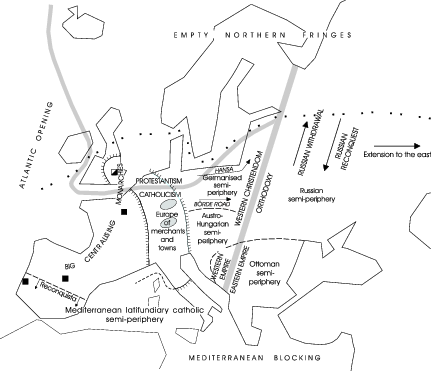 20In the western part of Europe, the opposition between Atlantic Europe with precocious state formations and middle Europe with principalities and above all merchant towns, was to become partly superimposed on the division between Roman Catholicism and Protestantism. Admittedly the superimposition of the two divisions is not perfect, and the origins of Protestantism were multiple. In some cases it became attached to peasant protest movements against landlords and the Church, which supported the former or itself behaved like a large landowner. In other cases Protestantism became involved in emancipation drives by the urban bourgeoisie against the constraints imposed by the Church or by traditional economic organisations and guilds supported by the Church which blocked opportunities for individual economic initiative. In some cases, too, Protestantism was adopted by the royalty or nobility in a bid to promote their own political interests. Be that as it may, with the development of Protestantism, religion, which was already a more individual matter in the Catholic world than in the Orthodox world, became a more private affair, but a private affair which at the same time guided the economic and cultural ethics of élites and promoted literacy. The positive effects which Protestantism had on economic development were either the result of Protestant bourgeoisies invested with political power (the Netherlands), or sharing it with the monarchy (United Kingdom), but also of educated rural societies capable of underpinning the bourgeois investments (Netherlands) or of benefiting from the early agrarian reforms introduced by the enlightened despotism of the monarchy (Denmark, Sweden). The Counter Reformation, on the contrary, led to economic stagnation. Some adverse effects of this were felt right up until the start of the 20th century. Table 3. Sea port location. 21But the main consequence of transferring the centre of gravity of the European economy to the Atlantic shores and, in particular, to the areas in which bourgeois power was predominant (Netherlands) or in any case associated with the monarchy (England, and France to a lesser extent), was the formation of a world economy and an international division of labour in which the more remote parts of Europe, both eastern and Mediterranean, were placed in a semi-peripheral position, specialising in supplying to north-western Europe agricultural raw materials and, later, mineral raw materials. The result was the reinforcement in these parts of Europe of a combination of royal power and landed aristocracy. This was reflected in the accentuation of pressure on peasants, particularly in the plains, and emerged among other things in the development of the new serfdom which will replace the communal peasant structures in the parts of north-eastern Europe the most open to Baltic trade. In some cases the landed aristocracy went so far as to reject all state political commitments in order to concentrate on its estates, therefore considering that it could do without the monarchy. This was the case in Poland, and it led to the disappearance of the Polish State at the end of the 18th century. While in Prussia and in Austria-Hungary the enlightened despotism of the monarchy and its military ambitions managed to give rise to certain industrial mercantilist developments underpinned by the State, this was less true in Russia and even less so in Ottoman Europe. The latter found itself in a peripheral position on two counts: subject to the interests of Constantinople and the big tchiflik landowners on the one hand, but on the other forming part of an Empire which was itself entering a decline and about to become marginalised in the world economy from the start of the 18th century. Figure 4. The balance of power in the political formations of the second half of the 18th century. 22Knowledge of the nature of the state formations at the end of the 18th century is therefore essential to understand the geography of the initial phases of the Industrial Revolution. This Revolution could have emerged only in territorial formations of a certain size, whereas the pre-industrial market economy had no need of such a territorial base, although in some cases the territorial base (including its colonial extensions) reinforced the merchant middle classes through the arrangements underlying their association with the monarchy. Moreover, the existence of potential colonial outlets was to be an important factor in industrial development in a 19th century in which the domestic purchasing power was weak and the export of capital goods could supplement the limited absorption capacity of the national market. Understandably the Industrial Revolution could not have started early in a country like the Netherlands in which the bourgeoisie predominated (the Protestant aristocracy having by now itself adopted the behaviour of the bourgeoisie): apart from the consequences of the lack of coal (although there was peat and wind power), the country was too small and the relative weakness of the central State did not permit the upkeep of a strong and permanent military fleet. The Industrial Revolution therefore started in the United Kingdom, in an average-sized country, admittedly favoured by its insular position and coal resources, but above all a country in which the State was organised early on, in the context of an association imposed on the monarchy by a strong trade-based middle class and an aristocracy which supported land-based capitalism (Great Britain). In France the bourgeoisie had to overcome in a more brutal fashion the contradictions that emerged from its association with the monarchy, because of, among other things, the greater importance of traditional land ownership and of the more conservative attitudes of the aristocracy. Here, too, however, the State was organised at an early stage and became established even before the Nation emerged. More than in Great Britain, it was to continue to influence the shape of development since the State is more necessary for the bourgeoisie to support and finance growth that arrived a little later and therefore required more capital. Of course it cannot be claimed that Belgium, where the industrial revolution got off the ground even before it did in France, was an average-sized country with a long state tradition. But it did benefit from the combination of a strong urban merchant and craft tradition (although this was somewhat sleepy), from the effects of diffusion as a result of its proximity to the initial centres of the industrial revolution, from the influences, before independence, of French and Dutch capitalism, not to mention the importance of its coal resources that had long been exploited. Table 4. 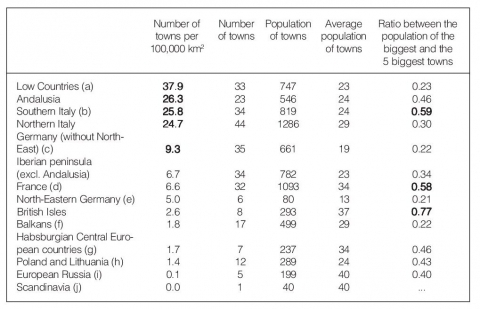 Urban development in Europe in 1850 (towns of over 10,000 inhabitants). Figure 5. The industrial revolution. 23In middle Europe, towns and the merchant middle classes were historically well developed, but on a fragmented territorial basis. Thus when territorial unification became necessary as a basis for the formation of a national market and industrialisation, the concept of Nation preceded that of State. The urban bourgeoisie had to ally itself with an ambitious monarchy to obtain the necessary territorial frameworks: the Rhine bourgeoisie allied itself with the King of Prussia, after which the Habsburg power caused a more endogenous endeavour to fail by attacking the Diet of Frankfurt, which eventually cost it the defeat of Sadowa and the establishment of the Reich3; the Italian bourgeoisie allied itself with the King of Piedmont, in agreement and in a compromise with France, after the latter had caused the failure of an attempt to establish a Roman Republic (but France will then delay the annexation of the Pontifical States by the new Kingdom). 24Thus we arrive at the fundamental causes of the continuity between the maps of pre- and post-Industrial Revolution Europe. Admittedly the centres of industrialisation of the first (1780-1812-1842) and still largely of the second Kondratieff cycle (1842-1873-1896)4 are very much linked to coal resources. But these are not exploited and above all do not generate endogenous development except where capital is readily available nearby and where mining can be linked to industrialisation based on the resumption of craft traditions. The initial industrialisation may certainly trigger off sensitive geographic shifts, but only on a large or medium-sized scale. British industrialisation started first in the coalmines of the Pennines and passed London by. However London kept political and commercial control, based on an age-old state tradition. The centre of gravity of the Belgian economy shifted from the Flemish textile industry (which lacked coal and which was to decline in a lengthy crisis connected with the delay in modernisation of a proto-industry in which the Belgian capital was not interested) to the Walloon coalmines, but with control remaining in Brussels. The initial industrial centres in the Rhine are in the coalfields, not in the large Rhine towns or even in the Hellweg towns. But on the small scale of a map of Europe, the first endogenous industrial developments remained close to the urban and capitalist centres of the earlier market economy, in the countries where the socio-political structures permitted a premature industrial revolution. 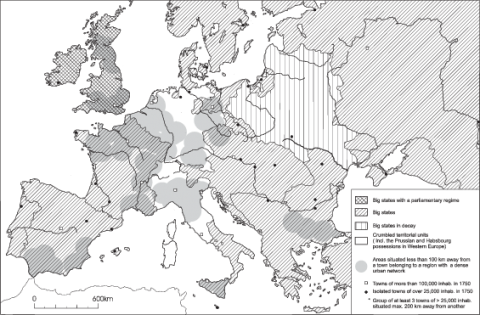 Apart from these areas, coal managed to engender isolated examples of industrial development, but which was in most cases controlled from the outside, and the initial developments were not disseminated throughout the national economy (Asturias, Donetz). That is the essential cause of the small-scale continuities between population distribution and wealth distribution before and after the Industrial Revolution. 25In Centre-Eastern, Eastern and South-Eastern Europe, industrialisation was to be delayed by the maintaining of absolutist structures based on the powerful aristocratic land-owning class, by the mediocre level of the agrarian productive base, by the skeletal nature of the young national bourgeoisie classes in regions that were under-developed in urban terms, and hence lagging behind in terms of formation of Nation States, and by the emergence of the latter due to foreign intervention in the context of a national identity combining peasant and religious elements. The national ideology of the young States was based on highlighting difference compared with others, and on very remote identity references that are fairly mythologised: the Czar Dushan for the Serbs, ancient Illyria for the Albanians, and the Dacians for the Romanians, etc. The holistic nature of this national identity ideology was thus reflected in Romania by the refusal to recognise regional special features, regional cuisine and regional dialect nuances, while at the same time (as a result of its peasant past) the wealth and diversity of local folklore was underlined in a rather schizophrenic approach. Difference was presented as being external to identity. 26Population density maps for this part of Europe remain largely marked by the imprint of continuity with the rural past, sometimes reinforced by contrasts of fertility: high density in Catholic Poland, outside the areas of big German landowners; vacuums in the Pripyat ‘ Marshes, frontier between the Catholic and Orthodox worlds; relatively empty plains recently won back from the Turks (Hungarian plain), sometimes with forms of colonisation leading to early low fertility levels (Banat); late subsistence of forms of big land ownership and important export culture maintaining quite low population densities (Walachia), while the sheltered areas of mountains and piedmonts were more densely populated (Walachia and Moldavian piedmonts). In opposition to this overall continuity, the most spectacular discrepancy on a small scale is, in Eastern Europe, the inversion of the density between Russia and Ukraine: the latter had been emptied by the Mongol and Tartar invasions, leading to the mediaeval Russian withdrawal into the forests, where the political hub of Moscow was to become the main settlement centre. 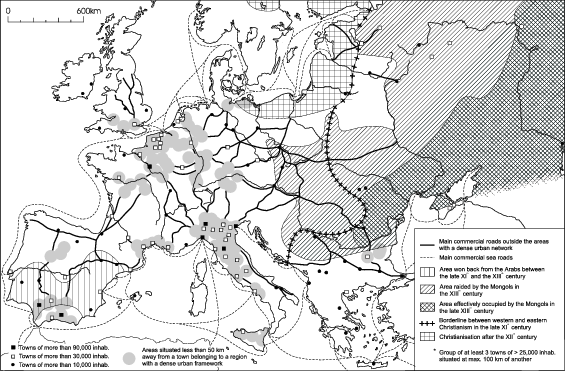 From the 17th and 18th centuries, the more fertile steppes were repopulated, restoring a gradient of population density that complied more closely with natural features, in the semi-peripheral context of a major cereal-exporting economy. It was not until the end of the 19th century that the first centres of industrialisation were established in the Donetz coalmining area, controlled exogenously by Western European capitalism, and above all the deliberate Stalinian industrialisation drives which increased the growth of the eastern Ukraine area and produced other major changes in the population density map of this part of Europe, particularly in the Urals. Stalinian industrialisation, planned to serve a monopolistic form of State capitalism, created centres of development that were independent of the old capitalist centres, which in fact were very weak in the Czarist Empire. Nonetheless, this deliberate policy and the priority given to heavy industry did not undermine the importance of the nucleus of population density in the central industrial region, organised around Moscow. 27The first two Kondratieff cycles led, on a large and medium scale, to changes in population distribution, in favour of coalmining areas. From the third Kondratieff cycle (1896-1912-1947), the big towns and traditional urban areas became important again as main focus of economic development. This reinforced further the effect of continuities. This was because industry no longer needed to be located close to coal sources from the end of the 19th and above all in the 20th century because of the reduction of transport costs, the development of new energy sources and the significant growth in services and technological training of labour, for which large towns are preferential locations. This encouraged the development of metropolitan regions. 28The gradual weakening of the constraints of location near the coal industry (first for light industries) also permitted the revitalisation of regions with old urban and merchant traditions, sleepy since the Counter Reformation but eager to be given new impetus. The economic revival in the 20th century can be said to have been based there on initiatives by small and medium-sized local entrepreneurs, in a flexible economy which was already creating niches within the triumphant Fordist system and in areas characterised by a paternalist socio-political framework governed by social christianism (Flanders, southern Germany, north-eastern Italy) or founded at least on a strong socio-political regional consensus (Third Italy). The success of these areas, which correspond largely to the industrial districts, was based both on a rich urban past, even though this remained dormant for several centuries, and a sound agricultural basis, with the new entrepreneurs emerging from both backgrounds. This regional consensus, in regions that are now prosperous but which had long remained lagging behind, may have been based on strong resentment against a national central State if the region had been subjected to the authority of a central power which neglected it economically and bullied it culturally (Flanders, Catalonia, Basque Country), or was at least based on solid conservative particular-isms (Bavaria). Now that European unification is reducing the importance of the Nation State as the compulsory framework for economic development, it may also give rise to the populist ‘anti-bureaucratic’ regionalism of the northern Italian Leagues. 29The conjunction of a first phase of industrialisation based on coal and a second phase of metropolitan industrialisation, followed by attraction to littorals which was underpinned by coastal heavy and petrochemical-based industrialisation during Fordism and by the development of tourism, was to lead to the abandonment of the interior of certain countries through a rural exodus, particularly in countries where economic under-development was paired with state centralisation (Spain and Portugal), or where state centralisation was combined with the age-old survival of archaic agrarian practices and a prematurely low level of fertility (France). Figure 6. A synthetic regionalisation of Europe. Table 5. Reinforcement of population density contrasts in certain European countries. Based on the counties in Great Britain, the departments in France, the provinces in Italy and Spain, the voivodes in Poland, the kreis in Germany (Regierungsbezirke in 1980). One-fifth of the area of the country corresponds to 45,000 km² in Great Britain, 110,000 km² in France, 92,000 km² in Germany (50,000 km² in 1980, for West Germany only), 78,000 km² in Poland, 65,000 km² in Italy (60,000 in 1980) and 100,000 km² in Spain. Table 6. Level of per capita product, with purchasing power at parity, within current political limits (At 1990 Geary-Khamis international dollars until 1985; in PPP$ at current prices in 1997). Sources: personal calculations based on figures by Maddison (1995), I.T. Berend & G. Ranki (1982), UNDP World Development Report (1999), EUROSTAT and national reports. Personal estimates for the breakdown between northern and southern Italy in 1913 and 1950. 30After the Second World War, it is true that given the rarity and increasing expense of labour, the rationalisation of industrial processes and the development of foreign and state investments, Fordist-style industrialisation was to spread to areas that had long remained rural, peripheral but relatively close to large developed areas in Europe which still had sufficient reserves of labour (Paris Basin, Belgian Limburg). In Western Europe, suburbanisation and the homogenisation of space through more flexible and more rapid transport systems would also slow down, or even reverse, the process of polarisation of population density. 31Industrialisation was also to spread to the southern parts of Europe where European and national development aid would take over the investment policies already begun by the Fascist Governments (which tended to intervene in economic matters) in order to establish growth poles. This would permit the periphery of Western Europe to catch up, to a certain extent. However, this process was to be slowed down and even interrupted when growth based on Fordist industrial investment during phase A of the fourth Kondratieff cycle (from the end of the War to 1974) turned into a rather slow and then more flexible, more globalised and more service-based growth, during phase B. In this new context, the periphery integrated into the European Union suffered from a lack of the advantages of the central regions, while at the same time having less comparative advantages in terms of labour-intensive activities than those offered by parts of the extra-European periphery. 32In the past decade we have witnessed a trend towards re-metropolisation and the increased concentration of headquarters, financial and management centres in the biggest metropolitan areas, which are the best serviced on a world scale and are located in central countries. This is because the new world dynamics which is forming is attracted by financial activities and very high-tech sectors (information technologies, biotechnology, etc.). But the effects of this re-metropolisation must be measured at the scale of the enlarged metropolitan regions. They are not necessarily perceivable in statistical terms at the scale of the central agglomerations, on the contrary sometimes. They do not rule out the possibility of the aggravation of social and economic problems and growing dualisation in these central towns. 33Integrated (semi)-peripheral regions react in different ways to these new structural conditions. Some parts (as well as centres of old industrialisation included in central regions) are unable to heave themselves out of the post-Fordist slump: this has occurred in the regions where the framework structures are the least dynamic, the least enterprising and the most dominated by clientelist practices and a non-market sector ‘by default’ or even parasitical. This is the case in southern Italy and Greece. Other parts of the (semi)-peripheral regions have, however, experienced vigorous growth. This is in particular the case in Ireland: here semi-peripheral industrial development was based on a particularly favourable cultural context for Anglo-Saxon investments, geared to the establishment of the labour-intensive segments of advanced technology, and it managed to take considerable advantage (in a small State) of aid granted under the European Structural Fund. This aid also appears to have been very profitable for Portugal. For Spain too, where the productive and banking systems are integrated in a quite effective way, it was more profitable than for southern Italy, handicapped by the lack of interest paid to it by national capital concentrated in the north of the country. 34In Russia, because of the historical weakness of national capitalism and structural under-development in a situation in which the aristocracy was a dominant force, industrialisation could only take off in several centres dominated by Western European capital. This delay was already reflected in defeat during the Russo-Japanese war, but it led above all to the chaos of the First World War. Regardless of the political forces that started it, the Bolshevik Revolution rapidly (or in any case once Stalin’s great five-year plans got under way) turned into an operation of forced industrial development in a despotic and a-cyclical context, under the aegis of de facto State capitalism, and through the radical transfer of human and material resources from agriculture to industry – the cost being the sacrificing of agriculture, something from which the Russian economy has not yet recovered. This process was extended after the Second World War to Central-Eastern Europe and the Balkan area. 35The centralised planned economy permitted satisfactory economic performances during the phase of basic heavy industrialisation, in the context of a rigid accumulation regime. In social and educational terms, the strict supervision of society was also a success initially, as can be seen for example in relation to life expectancy which caught up with Western Europe up until around 1965, thanks to the benefits of mass prophylactic medicine. Apart from the question of individual liberties and insufficiency in relation to agriculture, this administratively supervised industrial growth and the extremely rapid urban development that accompanied it had, however, a ‘geographic cost’: the authoritarian social and economic uniformisation policies were based on spatial restructuring. The aim was both to remove spatial disparities and to uniformise the territory by means of deliberate choices regarding location of industries. Moreover, centralised economic control crushed urban hierarchies and reduced horizontal relations within the urban system in favour of vertical relations between small towns and administrative chief towns and between the latter and capital cities. It subjected the reorganisation of regional borders to the sole logic of centralised economic control, or even of political decisions aimed at diluting or controlling ethnic communities. 36The tight interweaving of economic and political logics – all radical economic reforms challenging, by their very nature, the actual legitimacy of the constraints imposed by the centralised political system – explains why the system proved incapable of shifting to a more flexible regime which would have been essential to ensure the development of an economy based on the rapid integration of advanced technology into the production process. The opening up of the former Soviet Union to exports of raw materials on a more massive scale after 1974, the under-development of agriculture leading to the extensive importation of cereals, and the inability to adapt to new technology, which led to the stopgap measure of importing turnkey factories which were ineffective because the traditional centralised management system was retained, all led to a deep crisis in the system which was reflected in the halting of economic growth in the 1980s, despite continued investments. The crisis also emerged in the social arena. The changeover to advanced medicine, which gave a boost to life expectancy in the west, did not happen here. From the spatial point of view, the growing atony highlighted the role of the lost diversity for stimulating exchanges and economic dynamism. Figure 7. 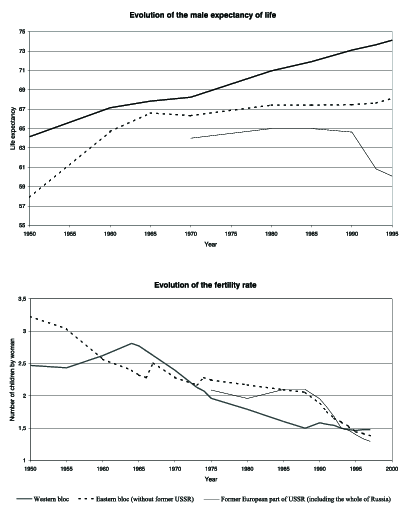 Evolution of life expectancy and fertility in Western and Eastern Europe and in Russia. 37This complex crisis was to precipitate (within a few months) the top-down implosion of a political system that had until then (no doubt wrongly) been presented as extremely monolithic. The implosion essentially benefited some of the former nomenklatura and technocratic élites, who privatised the economy for their own benefit and placed the Soviet system in a new peripheral situation vis-à-vis the world economy. Far from solving the social crisis, this step accentuated it: it was even more badly received by the people because no clear economic or political prospects were emerging in their eyes (except perhaps in the countries closest to the European Union, which had the best chances of succeeding with semi-peripheral integration) and because the inhabitants of these countries, not only the élites, felt close to the cultural values of Europe or shared them sufficiently to use the European Union as a reference model, albeit one that was largely inaccessible. The crisis materialised in an explosion of social inequalities, in some cases in recomposition between the rural and urban communities, and was also reflected in migration and demographic effects, with a collapse of fertility. 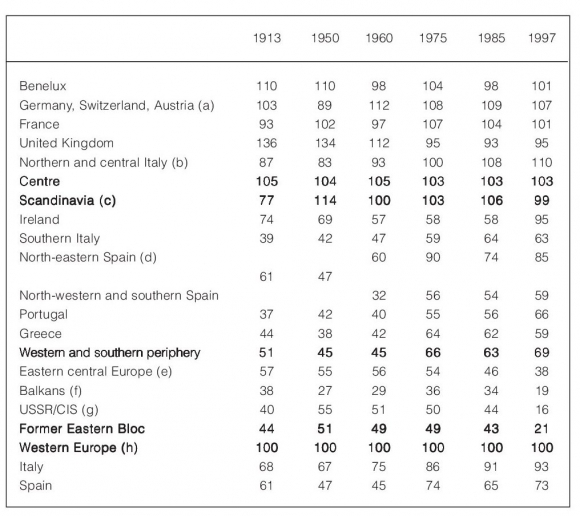 In terms of life expectancy, even more so than in the 1980s, the main opposition in Europe is now between the east and west, whereas it was still significant between the north and Mediterranean south at the beginning of the 1960s. 38The continuity between (at least a part of) the former nomenklatura and the present élites may induce them to legitimise themselves by engaging in a relentless pursuit of nationalist, chauvinistic positions which are connected with and revitalised by traditional, peasant and religious forms of national feeling, particularly where the lack of positive economic results is most blatant and where social regression is most evident. They obviously represent a political lever that is very easy to apply because the delay in the formation of Nation States in this part of Europe has often allowed complex ethnic situations to persist, or at least the memory of them – as can been seen from the anti-Semitism of a Poland without Jews! This is obviously less true in the most western parts of the former Soviet bloc, where the national movement had sometimes already reached, to a greater or lesser degree, the stage of constitution of a democratic state before the introduction of Communism, where the historical urban base was more deeply rooted and, above all, where more favourable conditions regarding proximity to Western Europe permitted more positive growth prospects based on the exploitation of a skilled, low-paid workforce and external control of the economy, either through direct ownership of capital or through the establishment of subcontracting links in the context of semi-peripheral integration into the Western European productive system. The further east and south-east one goes, the more the power of the converted élites is based on sole and more or less Mafia-based control of a disarticulated internal economy and on imports/exports, particularly the exporting of raw materials, with particularly poor performances in terms of GDP evolution. 39Europe is built on an organic integration dialectic between economy and culture. Its considerable diversity and variety even on a great scale is a result of its ancient civilisation (unlike North America), but also of the historical fragmentation of its political frameworks (unlike China). It is marked by strong divisions, the prime ones being religious divisions, which are not themselves dissociated from economic and cultural developments. Some of its divisions go back to over a millennium ago. Yet this diversity does not rule out a number of common references: Europe does exist. 40The unequal development levels in Europe, just like the continent’s population density map, cannot be understood, at least on a small scale, without reference to the long-term historical processes, which comprise the geography of innovation and the differentiation of socio-political structures on the continent on the eve of the Industrial Revolution, without taking account of old differential levels of urbanity and without a grasp of the structuring of the European economy during the mercantilist, pre-industrial, world economy phases, which spread from the Western European cradle. 41The Nation State framework, more or less completed, has become the compulsory ideological reference for political organisation in Europe in the 19th century. Now in the west it is beginning to be challenged by the unification imposed as a result of the growing monopolisation and ‘worldisation’ of the economy, but we are at the same time witnessing a return to a local socio-political level, which sometimes goes so far as to question the nation state from the bottom up, but generally in a democratic way. In the east, the nation state is being rebuilt, sometimes rather bloodily, in a context in which, paradoxically, there is a holistic reaffirmation of national identity and a late and savage discovery of frenzied individualism. In this part of Europe, the references to a common European identity are also becoming a source of frustration since the economic disparities with the west are of approximately the same extent as between the latter and the Maghreb. 42On the smallest scale, the Communist phase confirmed and is the result of a pre-existing division. There is little risk that this division will be removed in the short or medium terms by reintegrating this part of Europe into the world economy on a semi-peripheral or peripheral basis. This raises the question of the enlargement of the European Union, at least beyond the first group of candidate countries, particularly as regards preserving social legislation, in a context in which the forces calling for rapid enlargement are being steered by economic rather than by political and social considerations. To paraphrase V. Rey, the question now is how to link common identity and heterogeneity. Paradoxically the challenges are thus doubtless more serious than as regards the relations to be forged with Mediterranean Muslim countries, where the question of shared identity does not arise. BAIROCH P. (1985), De Jéricho à Mexico. Villes et économie dans l’histoire, Paris, Gallimard. BAIROCH P. (1997), Victoires et déboires. Histoire économique et sociale du monde du XVIe siècle à nos jours, Paris, Gallimard. BAIROCH P., BATOU J. & CHEVRE P. (1988), La population des villes europé-ennes de 800 à 1850, Genève, Droz. BEREND I.T. & RANKI G. (1982), The European periphery and industrialization. 1780-1914, Cambridge, Cambridge University Press, Paris, Maison des Sciences de l’Homme. BRAUDEL F. (1979), Civilisation maté-rielle, société et capitalisme, XVe-XVIIIe siècle, Paris, A. Colin. CHAMPION T., MONNESLAND J. & VANDERMOTTEN C. (1996), ‘The new regional map of Europe’, Progress in planning, pp. 1-89. DECROLY J.M., VANLAER J. et al. (1991), Atlas de la population européenne, Bruxelles, Editions de l’Université de Bruxelles. FEBVRE L. (1944-45, éd. 1999), L’Europe. Genèse d’une civilisation, Paris, Perrin. FOUCHER M. (éd.) (1994), Fragments d’Europe. Atlas de l’Europe médiane et orientale, Paris, Fayard, Lyon, Observatoire européen de géopolitique. HALICZER J. (1934), ‘The population of Europe. 1720, 1820, 1930’, Geography, pp. 261-273. JUILLARD E. (1976), Espaces et régions en Europe occidentale, Paris, CNRS. MADDISON A. (1995), L’économie mondiale. 1820-1992. Analyse et statistiques, Paris, OCDE. MARCHAND J.P. & RIQUET P. (1996), Europe du nord. Europe médiane. Géographie Universelle sous la direction de R. Brunet, Paris, Belin. MITCHELL B.R. (1992), European historical statistics. 1750-1988, London, Macmillan. PHILIPPART E. (éd.) (1993), Nations et frontières dans la nouvelle Europe, Bruxelles, Editions Complexe. PREVELAKIS G. (1994), Les Balkans, cultures et géopolitique, Paris, Nathan. PUMAIN D., SAINT-JULIEN Th., FERRAS R. et al. (1990), France. Europe du sud. Géographie Universelle sous la direction de R. Brunet, Paris, Belin. REY V. & BRUNET R. (1996), Europes orientales. Russie. Asie centrale. Géographie Universelle sous la direction de R. Brunet, Paris, Belin. ROUX M. (éd.) (1992), Nations, Etat et territoire en Europe de l’est, Paris, L’Harmattan. TILLY C. (1992), Contrainte et capital dans la formation de l’Europe. 990-1990, Paris, Aubier. VANDERMOTTEN C. & MARISSAL P. (1998), La production des espaces économiques, tome 1, Bruxelles, Editions de l’Université de Bruxelles. VANDERMOTTEN C., VERMOESEN F., DE LANNOY W. & DE CORTE S. (1999), ‘Villes d’Europe. Cartographie comparative’, Bulletin du Crédit Communal de Belgique, pp. 1-408. WEBER M. (1905, éd. franç. 1964), L’éthique protestante et l’esprit du capitalisme, Paris, Plon. 2 Which did not, however, prevent Andalusia from being the most urbanised part of Spain until the 19th century, and also from benefiting partly from the opening onto the New World. 3 Louis Dumont thus contrasted the French universalist model - ‘I am a person first and French by accident’, with the motto ‘Liberty - Equality - Fraternity’ on the façade of the National Assembly, with the German model: ‘I am German first, and a person because I am German’, with ‘Dem Deutschem Volke’ on the façade of the Reichstag. But unlike what can be observed in Central-Eastern and Eastern Europe, the German model did not reject regionalism, an ideological continuation of the original fragmentation. It is structured, as in France, on an exclusively secular basis. 4 But already much less during the second Kondratieff cycle. Paris was a major centre of industrial development in France where industrialisation accompanied the development of the railways, whereas in Great Britain, where the start of the industrial revolution was based, in terms of transport, only on the canals and coastal navigation, London experienced relative industrial regression compared with the textile and coal centres at the end of the 18th century and in the first half of the 19th century. Belgium is in an intermediate position: the basis for industrialisation was the coal mines, but industrial growth was just as dynamic in Brussels as in the Walloon coal basins in the 1840s (and also quite soon in Antwerp). The dynamism of manufacturing in metropolitan centres was greater than that of Wallonia from the 1870s on. Christian Vandermotten, « Building a continental area: identities, differences and urban developments in Europe », Belgeo, 1-2-3-4 | 2000, 114-142.